Rector Ilshat Gafurov arranged a tour around the University’s facilities. This meeting is a traditional format where deputies of the State Council of Tatarstan, State Duma, and Council of the Federation (those who represent the Republic there), and executive administrators discuss how to make Tatarstan more attractive for investors. Chairman of the State Council Farid Mukhametshin was the moderator. The meetings are held quarterly at leading regional institutions and companies. Before the participants began their talks, they visited the University’s medical cluster. 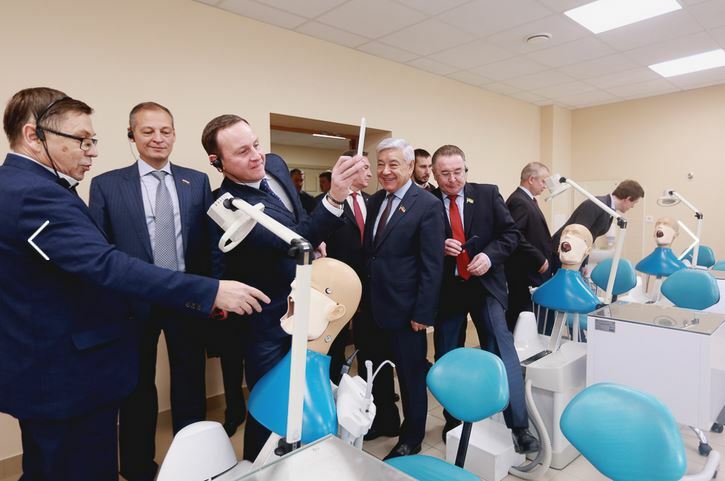 In particular, they watched around the University Clinic, which after merging with KFU in 2016 has already become a center for technology transfer and medical education. This is especially appealing for young researchers – the employees’ average age has decreased to 45 years. Minister of Economy of Tatarstan Artyom Zdunov then proceeded to report about federal investment in Tatarstan for the nine months of 2017 and tasks for the mid-term. The delegates also discussed the workgroups’ activities and actual completion of the tasks allotted during the previous convention. Another question on the agenda was a set of amendments to the Housing Code with regard to rebuilding non-residential premises in a multi-apartment building.